Every minute counts. Administration of antibiotics and fluids saves lives. This April 21st to 27th, Sepsis Alliance is launching Pediatric Sepsis Week to raise awareness of the signs and symptoms of sepsis in children and recognize the 75,000 children who develop sepsis every year in the U.S. This annual observance will be held the third week of every April. In the U.S., 200 children develop sepsis a day. More children die of sepsis than of childhood cancer. One-third of pediatric sepsis survivors show a decline in their functional status 28 days after hospital discharge. 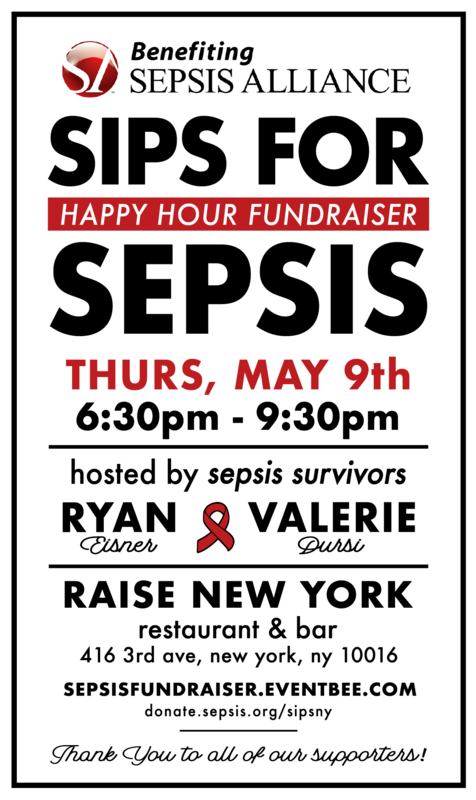 Join fellow sepsis awareness advocates and sepsis survivors Ryan Eisner and Valerie Dursi at Raise New York on Thursday, May 9th to raise funds for sepsis awareness programs. To purchase tickets for the event, please CLICK HERE or visit sepsisfundraiser.eventbee.com.